The goal of this tutorial is to show how you can turn a simple Hello World Node.js app into an application running on Kubernetes with all the best-practices applied. 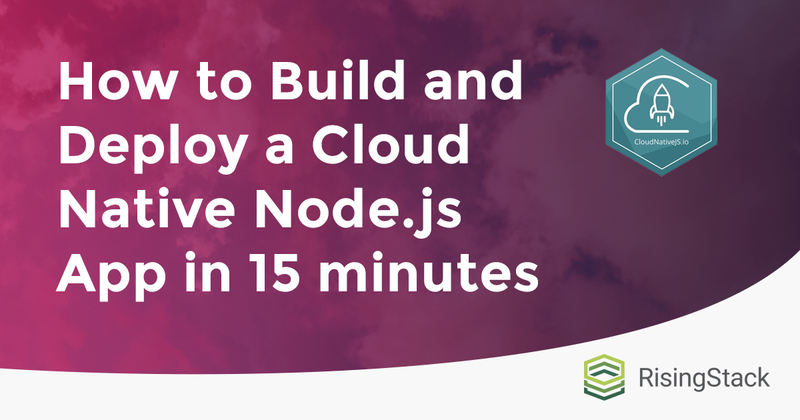 The tutorial shows you how to use the assets and tools provided by CloudNativeJS in order to build an enterprise-grade application, turn it into a Docker container image and then deploy that image easily on Kubernetes. You can find a prepared example app, a Node.js web server based on express, within the ./src folder which we will use during the tutorial. In case you are more into adventures, you can use the Hello world example app written by express or your existing application as a starting point. Either way you go, start with installing your dependencies by using npm i on a prepared project or npm init && npm i express. At this point, you should be able to run the server by node server.js which is reachable on localhost:3000. Kubernetes provides health checking in order to help you manage the lifecycle of your apps and detect the malfunctioning ones. We are going to prepare liveness and readiness probes to know when to restart the container and make the application more available and more available and resilient against downtime. Now, edit the server.js and register the new endpoints called /health and /ready. // This should be resolved once your app is up and running. // The result will be checked every time you hit /ready endpoint. // This will make the app ready after 60 seconds for testing purposes. // Naming your check helps registering multiple checks and identifying the hanging ones. In order to see the application’s state, restart the app and open localhost:3000/ready. Prometheus, is an open-source monitoring solution under CNCF, which helps you powering applications with metrics and alerting. Service monitoring means tasks of collecting, processing, aggregating, and displaying real-time quantitative data about a system. Prometheus gives you the ability to observe the application’s state and address issues before they impact your business. You can find additional information about getting started with Prometheus here or use this helm chart to deploy the tool and start monitoring and collecting metrics. The package called appmetrics-prometheus from CNJS provides the basic metrics (CPU, RAM usage) to be scraped by Prometheus. The prometheus.attach() must be called before instantiating the server because it will patch the constructor as well as the createServer method of the native modules in order to provide the /metrics endpoint with the collected metrics. We will use CloudNativeJS/appmetrics-zipkin to instrument our application automatically for an OpenTracing based request tracker called Zipkin. Install the necessary package with npm install @cloudnative/appmetrics-zipkin. Now you only have to include the require('appmetrics-zipkin') line in the entry point of your app before requiring other packages to let it correctly instrument other modules, so add it to the first line of your server.js file. Please note that this way the instrumentation will use the default configurations, but you probably want to use your Zipkin instance running within your Kubernetes cluster instead sending the traces to localhost:9411 so for further options take a look at the custom configurations. For further reading about OpenZipkin please visit the following guide or use this helm chart to get your first instance up and running quickly. In order to use the template files, copy them from the CloudNativeJS/docker project into your application directory. CloudNativeJS/helm provides template Helm Charts for deploying a Node.js web application into any Kubernetes based cloud. To do so, copy the template files from the project into your application directory. Now take a look at the ./helm/chart/nodeserver/values.yaml which contains the initial parameters for a simple deployment. First, we have to change the value of image.repository to use our own image called cloudnativejs-example. Please note that we have used the same image tag during build, so you might change this later. You can change other parameters as you wish, like Deployment (resources.limits, hpa) and Service (type, port) configurations. Feel free to save and commit your application Chart alongside your source code. As you can see, with the libraries provided by CNJS you can easily add monitoring and distributed tracing to your app which you can then Dockerize and deploy to Kubernetes using Helm Charts. At RisingStack we believe that these tools are extremely useful for Node.js developers to standardize applications within the cloud and speed up the development process. Originally published at https://www.cloudnativejs.io/blogs.html on March 19, 2019.